1. Regular desks are not kitchen counter height, so the first step is raising the desk up. Begin by measuring the top of the desk. Use those measurements to make marks on one sheet of MDF. Cut a rectangle shape out with a circular saw. Be careful - MDF is super messy! 2. Turn the desk over so that the legs point to the sky, center the cut MDF onto the desk and screw into all four sides. We screwed directly into the two legs on one side. 3. While the desk is still upside down, attach the furniture legs to all four corners by screwing them into place. 4. Turn the island back over. You've now raised it to the appropriate island height! For the top, cut the other piece of MDF 2-3 inches longer and wider than the first piece. This will be the top and allow for a small overhang all the way around the island. Attach the MDF directly to the top of the desk, screwing in from the underside so that you don't see screws on top. 5. Cut the extra MDF into 2-inch strips to case the outside of the island top and nail into place. This "beefs up" the counter and makes it look more finished. For the bottom, to cover the furniture legs on the side that houses the drawers, we used MDF to case it out, as well. This step is not necessary, but definitely makes the piece look more substantial and less like an old desk. 6. Paint the entire thing your desired color and add the new hardware to the drawers and the towel bar to one end of the piece. 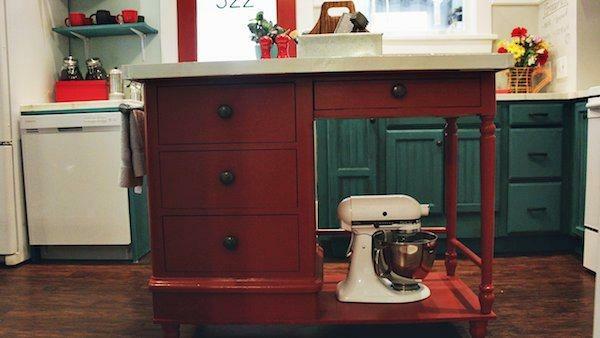 We used our faux marble paint treatment on the top so that it really looked like a kitchen island when we were done!